Ambiorix Burgos is mean, and he wants you to know it. It's about time. After dropping 12 straight road games to begin the season, the Royals tonight eeked out a nice 1-0 shutout win over the struggling Minnesota Twins. Jeremy Affeldt picked up his second win of the year, and while he didn't allow any runs and only surrendered three hits, his control was less than marvelous. Over five innings, Affeldt walked six, and twice he had to work out of bases-loaded jams. Affeldt was throwing harder than usual, dialing his fastball all the way up to 97 mph, but he struggled to locate both his fastball and curveball consistently. Quite frankly, he was lucky to escape without allowing several runs, but RC will take it. Of course, the anemic Twins offense did its part to help him out, and so did the Royals' defense. Emil Brown turned in a quality -- if not highlight reel -- sliding catch, and Doug Mientkiewicz probably saved a run or two in the third inning when he dashed across the diamond to field a Luis Rodriguez sacrifice bunt attempt and threw out Juan Castro at third. Affeldt had walked both Castro and Shannon Stewart to lead off the inning, but Minky's stellar play completely killed the rally. Of course, the true hero of the day was the bullpen, which entered the game in the sixth and completed the shutout by tossing four excellent innings, walking nobody while surrendering only two hits. In fact, over the last two games, the bullpen hasn't allowed a run or a walk (and only three hits) in 8.2 innings while recording seven strikeouts. Admittedly, much of this is merely a testament of how poor the Twins' offense truly is, but at the same time it's encouraging that the bullpen may once again be turning into a strength for the ballclub. 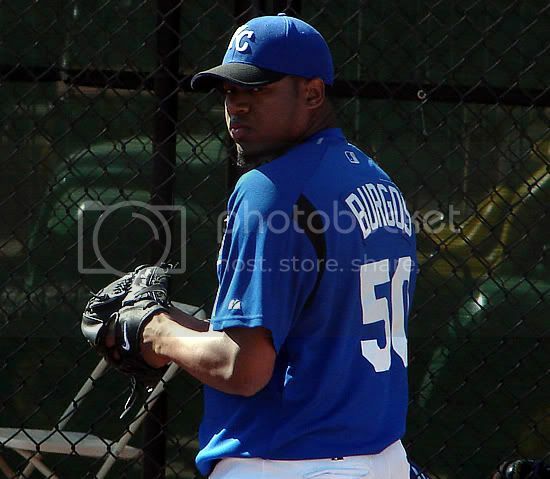 And who can argue that Ambiorix Burgos isn't one of the most dominant young relievers around? He's looked completely unhittable lately. Offensively, the Royals again failed to look very sharp, and Mark Teahen looked particularly bad while striking out twice. And the really bad news is that Teahen entered the game as a pinch hitter for Reggie Sanders, who left the game with a sore hamstring. Sanders is day-to-day, and his injury really couldn't have come at a worse time. For the next couple of days at least, the Royals figure to be without their three best hitters, so Buddy Bell is going to have to get even more creative with his lineup. Paul Bako tonight started for the second game in a row, and he picked up the only RBI with a base hit to right field in the second inning. How often do we get to dig into our Paul Bako photo collection? The Royals now head to Chicago to wrap up the road trip with a three-game set against the White Sox. They'll draw Jon Garland, Javier Vazquez, and Mark Buerhle, so the offensive struggles are likely to continue. The Royals will need good starts from Scott Elarton, Runelvys Hernandez, and Mark Redman to stay with the Sox, but crazier things have happened...like the Royals being on the winning end of a 1-0 road game. Hopefully huber will hit tomorrow.. and a new era will begin..
We'd have as many wins as the Twins ONLY if we had not let Mays, Hudson, and Stemle pitch on our team. I calculated the numbers, and if you take out Mays, Hudson, and Stemle (the three cancers of our pitching staff who has NO business being on this team whatsoever), but if you take out those three, the rest of our pitching staff has an ERA of 4.16, which would be a pretty good pitching staff. That doesn't mean that our pitching staff is actually one of the best, because Baird's horrid personell decisions unfortunately to matter, but if we can get rid of those three for good (only one more to go...), then hopefully we can continue to throw solid consistently. 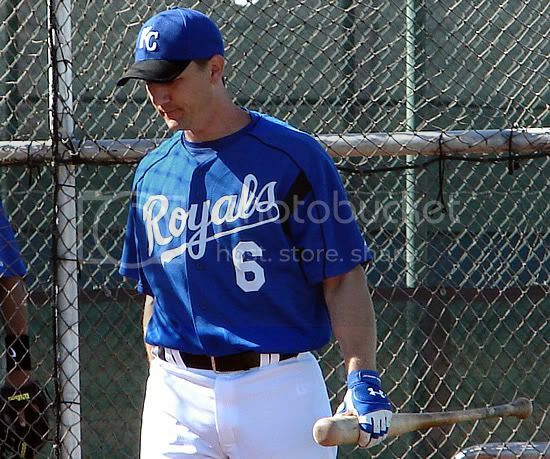 The Royals really need to get the bats going. I agree with kowboykoop that the pitching is in fairly good shape once Mays gets the boot. Hopefully we will be seeing a lot more of German and the other guys that are actually producing a little and we will stop with the politics of playing Teahen, Buck, Brown just because of what we gave up to get them. On another note, Dave I missed your weekly Draft Prospects Update this week. Tonight there is a premeir matchup of Tim Lincecum vs. Dallas Buck in the great northwest. I was really hoping Buck's drop in velocity, etc would drop him out of the first round and into the Royals lap at the top of the second, but it looks like he has righted the ship and has pitched 3 consecutive great games. This game is an ideal situation for someone like ESPN to televise. To bad they won't do it. Sorry about not having a new draft prospect update this week. I had planned to write it up, but I simply ran out of time. I looked at everyone's stats from last weekend, and there wasn't going to be any movement on the list anyway. I'll definitely have a new update on Monday or Tuesday, so I won't miss two weeks in a row. Did anyone see the quote by Buddy about why he wasn't playing Justin Huber because "it wouldn't be fair to Dougie"? This is why you don't sign multimillion dollar vets to play on a crappy team full of youngsters. Because "baseball guys" like Buddy feel obligated to play Doug Mietnkiewicz, Emil Brown and Tony Graffanino instead of younger, cheaper, and sometimes hungrier players. My vision would have been to bring in a ton of cheap replacement level talent. That way EVERYONE is expendable. If a guy isn't doing a job, he gets shipped out. Find your future Raul Ibanez, your future Jeff Suppan. Plus you can save the money for a year in which it makes more sense to spend money on free agents - when your young players are peaking. Instead, we're stuck with Dougie and Graf. It is maddening. Did anyone read Posnanski's article in the paper this morning? Talk about hitting the nail on the head. That was hilarious.